So Tennant did all the cooking, yes? ‘Well, most of the meals were cooked in a restaurant somewhere else,’ laughs the 58-year-old vocalist. Lazy sod. But then, there is very little time for home-cooked meals when you’re busy preparing a record. Elysium (classic Pet Shop Boys with some finely tuned hooks for a 21st-century audience) makes for album number 11. Not that Tennant is keeping score. Yes, but the fans will. Last year, the British electronic duo played support to Take That on the latter’s record-breaking Progress Live stadium tour. Eyebrows were initially raised. And then everyone saw the gig. Indeed they were. That both Tennant and Lowe continue to walk a comfortable line between classic pop act and relevant music-makers is quite the achievement. A good sense of humour always helps, as the lyrics to Your Early Stuff (from Elysium) show. ‘Your Early Stuff is remarks taxi drivers have made to me,’ says Tennant. 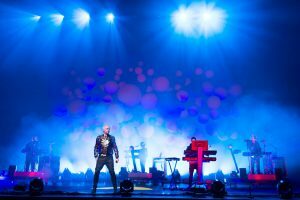 ‘I always travel around London in taxis and drivers often recognise me and they’ll talk to me about Pet Shop Boys and say, ‘I suppose you’re more or less retired now’. The whole line about ‘you don’t look too rough’ — someone actually said that to me. Really, I get this almost every day of my life’. Now you’re just bragging. ‘Actually, I even impressed myself with that list there! I was thinking, ‘Why do I complain so much in that case?” he laughs. So he doesn’t think about what might have been had he stuck with the music journalism?